This “Getting Started” article serves as a hub for information about Pocket for iPhone. It provides a basic introduction and also contains links to other useful Help pages. Pocket is a free app and is easy to install. Just visit the App Store and search for Pocket. You can also follow this link to take you to Pocket’s App Store page. If you’ve never used Pocket before, you’ll need to create an account. Open the app, then tap Sign up with Email. You can also click the Sign Up with Google or Sign Up with Firefox buttons if you’d like to use your Google or Firefox Account to create your Pocket account. Click here to learn more about using Google Sign On. If you already have a Pocket account, just enter your email address and password to log in. Or, if you signed up with a Google or Firefox Account, simply click the Sign In with Google or Sign in with Firefox button. Tap any item in your List to open it, or swipe across any item to show the item Actions. 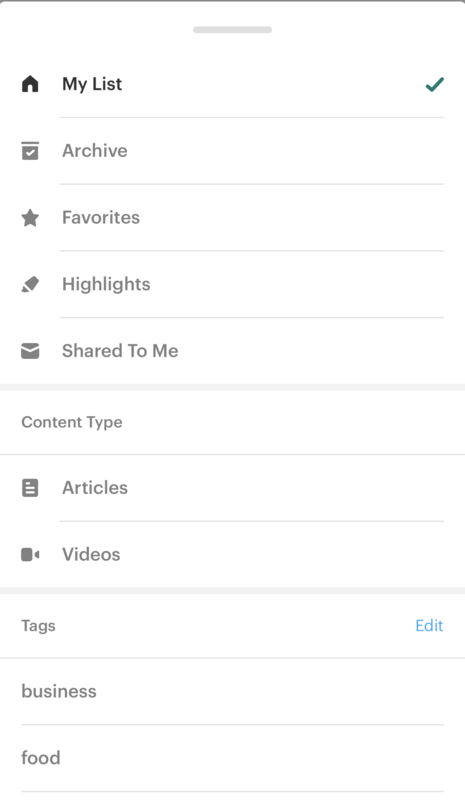 They make it easy to Tag, Archive, Favorite, Delete, and Share any item. What’s in the filters menu? When you open up Pocket for iPhone, you’re taken to your Home tab, where your List of saved items is displayed. If you tap Home again, this will reveal the filters menu, where you can navigate to other areas of Pocket. My List - When you save an item to Pocket, it will appear in your List. The List is sorted from newest to oldest by default, but you can reverse the order in Settings. Archive - The Archive is a great place to keep items that you may want to revisit in the future. You can view your Archive when you’re online. Highlights - All of the highlights you create will be listed here. Tap on a highlight to open the article it comes from. 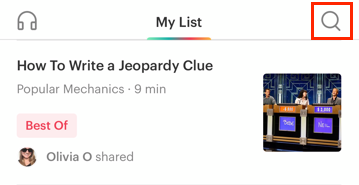 Shared to Me - This section lists items that have been shared with you using Pocket’s Send to Friend feature. Content Filters - There are two ways to filter your List: Articles and Videos. Each will show that particular type of content and hide the rest. Tags - Tags make a great way to organize items in Pocket. Selecting a tag from the Tags menu will filter your List to only show items with that particular tag. Click here to learn more about using Tags. Tap the heart button to open the Discover tab. In addition to saving pages to your Pocket account, you can visit Discover to see what’s trending in the Pocket community. 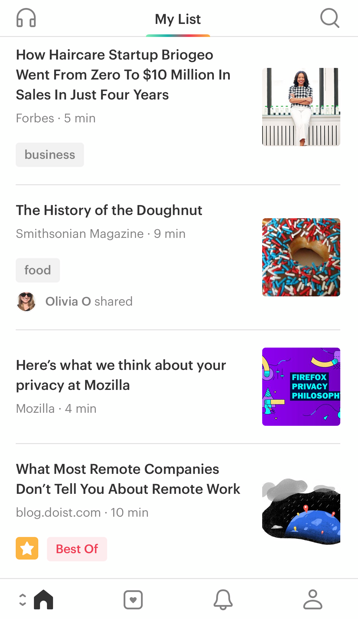 You can follow your friends on Pocket to see the stories they’re Recommending publicly as well. Click here to learn more about the Recommendations in the Discover tab. 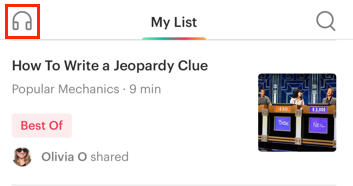 The Activity tab displays notifications for articles shared to you via Send to Friend, and updates from your friends and people you follow on Pocket. When you Recommend an article or video in Pocket, it will appear on your Profile, which can be seen by people who follow you. Sharing to your public Profile is optional, and your List is and will always remain private. Click here to learn more about viewing and editing your Profile. Tap the headphones button to start listening to your articles in Pocket. This is perfect for those times when you’re doing chores around the house or driving during your commute, when your eyes and hands are busy. Click here to learn more about listening to articles in Pocket. Tap the Search button in the top right corner to search for items you’ve saved in Pocket. All users can search for saved pages by their title and URL, and Pocket Premium subscribers have access to a host of additional searching options including full text search. Click here to learn more about the advanced search options with Pocket Premium.